Are your hamstrings tighter than a piano wire? Does your lower back ache like your grandma’s? Hip flexors feel as congested as I-5 at rush hour? When stretching fails to ease your lower back pain, myofascial release delivers flexibility, comfort, and ease. It’s a common error many of us make—when we feel tight in some part of our body we tend to focus on that area—stretching, massaging, kneading, or strengthening. It’s sort of a spot treatment approach to improving flexibility, and it can be a real waste of time. For instance, you could stretch your hamstrings all day, every day, and still have low back or hip pain unless you also address tightness in the adductors and hip flexors. One of the number one cycling related complaints is “tight hamstrings”. Most of us can confirm this tightness simply by doing a standing forward bend. If your hip flexors and adductors are also tight, you’ll probably feel it in your lower back too. Why? Because your hip flexors attach to the lower vertebrae. So, of course, you try to then stretch your lower back muscles. This stretching can feel good in the moment, but without also releasing the hip flexors you wind up chasing discomfort from one area of the body to another. A similar situation exists for many cyclists whose adductors compensate for hamstring weakness. Between these inner thigh muscles are fascial layers which help the different muscles glide against each other. If the fascia becomes dehydrated overworked or somehow damaged the tissues become sticky and nearby muscles begin to adhere to one another rather than glide. These sticky tissues—known as adhesions—are less responsive to stretching. Stop stretching and start releasing. Myofascial release can be achieved through a combination of bodywork such as Rolfing or deep tissue massage, passive stretching where the muscles are completely passive, such as yin yoga, or the dreaded foam roller. Nowadays you can find corrugated, knobby, textured, and even massaging foam rollers, but even the basic closed-cell foam variety will work. Foam rolling can be performed before or after a ride—or any time, really—to help release adhesions in the glutes, hamstrings, IT band, and adductors. If you’d rather change a flat tire every five minutes than torture yourself on purpose with a foam roller there is an easy movement you can do to release your adductors and hip flexors and it requires no more effort than laying on the floor. Less is more: passive release does all the work with less intensity. Like a 3-in-1 yoga pose, the Adductor/Hamstring Release stretches the hamstrings and adductors, and releases the hip flexors and lower back all at once. It’s a passive release, meaning there isn’t any stretching sensation for most people. 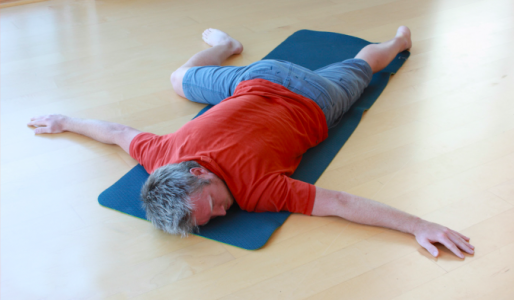 In fact, the vast majority of people will not feel any stretch in this pose. 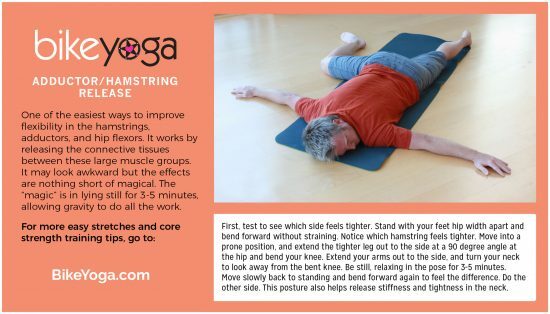 Don’t be fooled into thinking nothing is happening if you don’t feel stretching; myofascial release can be very intense but it can also happen just by hanging out for several minutes in this shape. Üma Kleppinger is the author of BikeYoga. She cut her teeth as a bike messenger in New York City during her film school days and has been riding ever since. A professional copywriter and ghostwriter, Üma is the founder of Allied Independent, a creative services studio based in Portland, OR. When she’s not she’s not on her bike she’s on an open mic at The Moth and other storytelling and improv venues.